Customers to Kmart: "Shame on you"
Kmart will open at 6 a.m. this Thanksgiving and stay open for 41 hours straight. Kmart had barely announced its decision to stay open for 41 hours straight, starting at 6 a.m. on Thanksgiving Day, when people started lashing out. Hundreds of Kmart customers took to social media and threatened to boycott the store if it didn't reverse its decision, so that its employees can spend Thanksgiving with their families. People called the decision "heartless," "greedy," "shameful" and "disgusting." 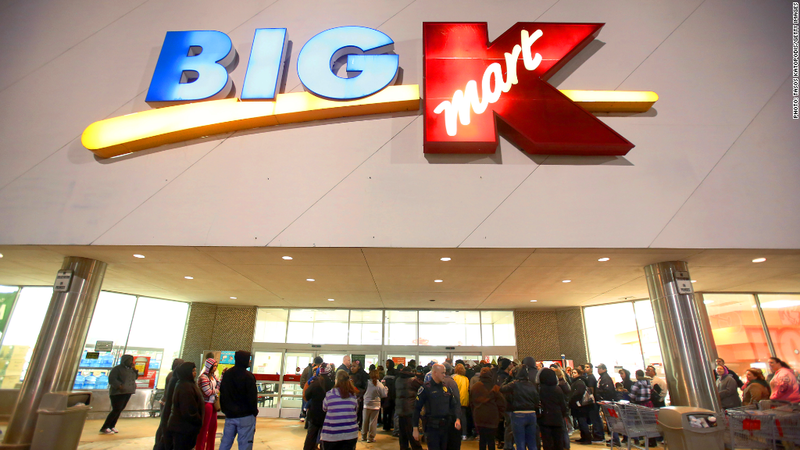 Kmart has opened at 6 a.m. on Thanksgiving for the past three years. Last year, however, stores closed for a few hours at 4 p.m. to let shoppers and employees get to their Thanksgiving dinners. "Shame on you, Kmart. I will never set foot in any of your stores again," wrote Tracy Lane on Kmart's Facebook (FB) page. "I have family members that work in retail and because of greedy retailers like you, will not be able to spend the day with us." Many customers expressed how upset they were for Kmart workers who would have to work through the holiday. "Maybe Kmart should have shown they are thankful for their loyal employees and let them be with their families on Thanksgiving," Jenn Tayrien wrote. "I realize you are a corporation and your goal is to make money...but sometimes you need to show and prove that people are important, too." One shopper said he hoped the retailer would go bankrupt because it has "proven [to be] morally bankrupt" by being open all day. Kmart, which is owned by Sears (SHLD), responded to a number of these negative comments, saying it will staff stores with volunteers and seasonal associates whenever possible. "This gives associates the opportunity to make some some additional money this holiday season," the retailer wrote. A Kmart spokeswoman said the company made the decision to extend the hours based on feedback from customers, who wanted more "flexible holiday in-store shopping times" and were eager to shop for deals. Many stores are opening on Thanksgiving Day, but are waiting until the evening to throw open their doors to deal hunters. Toys R Us is by far the earliest among those, announcing Tuesday that it would open at 5 p.m., three hours earlier than last year. Macy's (M), Kohl's (KSS), J.C. Penney (JCP) and Sears will let customers in at 8 p.m.